With IP network technology and infrastructure evolving, the distribution of video is changing. Dedicated coax-based SDI infrastructure are being replaced by transmission over standard IP-based networks. 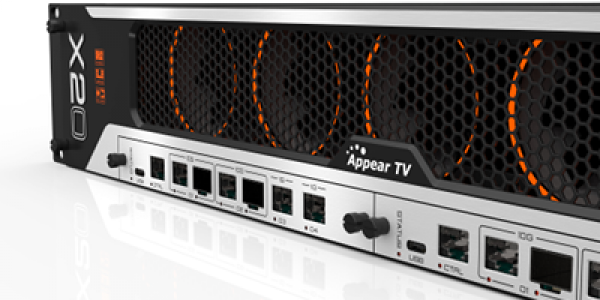 With 10G and 100G IP infrastructures available, broadcasters seek ways to use the added capacity, primarily for internal uncompressed or lightly compressed video contribution. 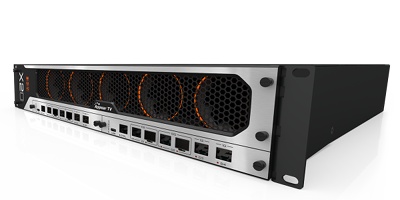 Specifically designed for IP-centric operations, the X20 chassis has a significant video processing capacity. 10G bi-directional IP interfaces provide firewall-grade IP security at every connection node. Built around a high capacity bus architecture that connects all modules, the X20 platform operates with dual hot-swappable power supplies, dual frontmounted control modules and twelve rear-mounted option slots with service density that can be defined up to 2,000 services in and out per module, extending Appear TV’s tradition of redundancy options. The X platform supports conversion of uncompressed video between legacy SDI and to/from SDI over IP with options to perform “light” compression/decompression using intra-codecs such as TICO and JPEG2000 or full encoding/decoding using AVC or HEVC.. With backplane latency of less than 1ms, universal applicability for virtually any video application is ensured, as is the implementation of both current and future IP video standards, including VSF-TR03, VSF-TR04 and SMPTE2110.